WAPAKONETA — As identical twins, Alex and Adam Walter, of Wapakoneta, have grown accustomed to doing things together. On Sept. 21, they reached one of the epitomes of their rare connection. Both completed their Eagle Scout projects that day. While the feat seems remarkable, it was just another thing to add to the list of the inseparable brothers. While both admit that there are slight facial feature differences that those who know them best can look at to tell the difference, most people cannot distinguish one from the other. They enjoy the same interests, dress in the same styles, and do things together. 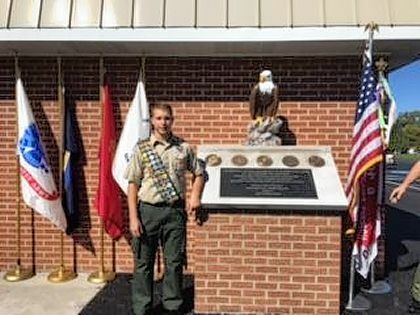 Adam completed a veterans memorial at the Veterans of Foreign Wars hall in Wapakoneta for his Eagle Scout project. 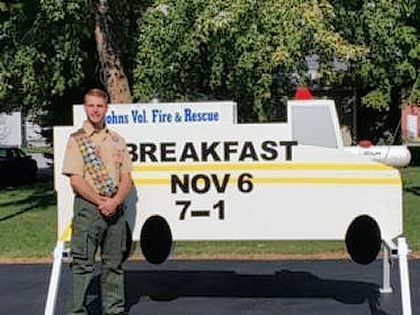 Alex made a new advertising sign in the shape of a fire truck for the St. Johns Fire Department to be used when they are advertising their fundraisers such as its annual breakfast. Alex’s project was 108 hours and Adam’s took 112. Both helped with each other’s project. Alex said having a twin is great because you always have at least one friend somewhere that you can rely on. The two have used their carbon copy appearance to have a little fun once in a while, just to see if they could pull it off. Generally, those moves are successful. “We have switched classes at school a few times,” Adam said. Both are planning on attending Ohio State University once they graduate this year. The brothers are seniors at Wapakoneta High School. Adam plans to study optometry and Alex plans to major in electrical engineering and premedical. They have been involved with scouting since the second grade. The twins are the sons of Jeff and Deb Walter.